PC upgrade using motherboard, processor, CPU cooler, RAM bundle - PC Buyer Beware! PC upgrade or buy a new computer. – I’ve been having problems with my desktop computer and I think it’s a hardware issue. It’s pretty old. I reinstalled Windows 10 but it keeps crashing and jamming. I think I might buy another PC. I don’t need anything fancy as I use it mainly for the internet, a few letters and occasionally watching TV. What would you recommend? It would be difficult to find out what is causing your problem. It’s an old PC, any one of the components could be on the blink, including the power supply unit (PSU), so taking it to a repair shop might fix the problem but probably only temporarily. In my opinion, the best and cheapest option is a PC upgrade that involves buying a motherboard-processor-RAM-memory bundle – if the PC already uses a standard ATX case for an ATX motherboard. The link below goes to a bundle that Amazon provides consisting of the motherboard, AMD APU processor, 4GB RAM memory. A processor heatsink-and-fan cooler is also provided. The AMD APU processor provides the graphics. They are excellent. Asus motherboards are excellent too. Cost – £140. Amazon provides more such bundles – the higher the specifications, the greater the cost – and they are also available from several other online computer stores. But the example is an inexpensive one that suits your computing needs very well. You just have to remove the existing motherboard and replace it with the bundle. Alternatively, you can buy all those components individually if such a bundle is not available in your country or you want to choose your own components. The only tool you need is a Phillips screwdriver. The existing power supply unit, hard drive and DVD drive connect to the motherboard. Just note where the connections are and then reconnect the cables to the new motherboard. There are a few other cables to connect, such as the Start button, cables for LED lights and any USB ports at the front of the case. All of the major motherboard manufacturers provide downloads of the user manuals in the PDF format for their boards. 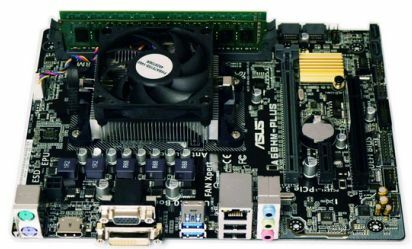 Here is a link to download the motherboard manual of the Asus A68HM Plus motherboard that the example bundle provides. It provides all of the component installation instructions and shows where the sundry cables connect to the motherboard. Don’t throw the components of your old PC away. You may still be able use them as spares. The power supply unit (PSU) might be faulty, so buy a new one. Corsair are the best, in my opinion – £40. Then you have a new PC for £180. But your existing PC must have an ATX case that can take the mATX Asus motherboard. Your existing PC might use a different form factor. For example, a mini PC uses Small Form Factor (SFF) motherboards. Most HP Compaq desktop PCs use SFF motherboards. To find out what its form factor is, conduct a web search of the computer’s make and model if you don’t have its user manual. You could also open the case to find out what the make/model of the motherboard is and look that up on the web. If you haven’t got an ATX case, you can buy one. Here is an excellent ATX case for £35. Your installation of Windows 10 on the PC’s hard disk drive won’t work because the new hardware uses different device drivers. If you have a Windows 10 install disc with a retail licence that allows Win10 to be installed on any number of computers as long as only one of them is in use, you can reinstall it. If your existing PC was made by a brand-name manufacturer, Win10 will have an OEM licence that cannot be used on another computer. If that is the case, you have to purchase Win10. Its setup process will install the new device drivers. Or you could just download Ubuntu Linux or Linux Mint for free. They would both work well for your computing needs. I still use Windows XP – support ended in 2014 – and have had no issues with virusues etc. Once set up that setup should last at least 8 years. If you don’t want to install the components yourself, just take them in to a PC repair shop. The small ones are the best. Make sure that you get a quote before the work is done or risk being ripped off. The job shouldn’t take an experienced installer any longer than about an hour. Also provide the Win10 installation disc (if it doesn’t have an OEM licence) the existing hard disk drive and DVD drive. That said, the installation of those components and Win10 is fairly simple to do yourself. The video below shows how to remove the old motherboard from the case and install a similar Novatech AMD APU motherboard bundle. If you want to buy a new PC, the AMD Ryzen processors are now beating Intel. Here is a desktop PC from Mesh with a Ryzen processor with its inbuilt Radeon graphics for £379 without a monitor and keyboard, which you already have. You just need the basic configuration. Win10 is included. You have a choice of alternative components. I would only change the 400W power supply unit (PSU) to the brand-name 500W option that costs an extra £18, because the one that comes with the PC might be a cheap unit that might not last as long as the rest of the components. It looks as if 400W and 500W are made by the same manufacturer, but you could get a different 400W PSU. In any case, a 500W PSU would leave plenty of overhead. There is no description for the 400W PSU, but 500W CPU is described as a “500W Aerocool Integrator Certified Power Supply”, so, if you choose it, that can be checked when you receive the PC. The PSU is a very important component, so having a quality unit is essential. See the image below showing the choices of PSU. PC upgrade – Power supply options for the Mesh PC. Click on the image to view its full size. July 20, 2018 in Motherboard and Power Supply (PSU) Problems, PC Problems and Solutions.